The Indonesian working class is fighting to end the age of cheap labor. A little over a year after the national strike on 3 October 2012, Indonesian workers launched another national strike. The demand: a fifty per cent increase of the minimum wage. In Jakarta, workers demand that the minimum wage, which varies from region to region, be set at Rp 3.7 million ($334) monthly. Jakarta is known to have an exceptionally high cost of living by Indonesian standards. An inflation rate that is predicted to hit ten per cent end this year is also pressuring real wages. Apart from wage increase, the movement demands universal health care by 1,January 2014 and the elimination of outsourcing. The ruling classes, through its business associations, media and government, are arguing that such an increase of the minimum wage would be impossible because of economic difficulties. As they always do, the ruling classes and their mouthpieces claim that a wage increase will force investors to leave the country. This cliche has not lost its power to influence the petty-bourgeoisie or scare the most vulnerable and precarious workers. But the well-organized industrial workers who took to the streets and joined the two day strike at the end of October and early November did not let themselves be intimidated. One positive development was the willingness of the majority of the Indonesian trade-unions to support the call to strike launched by the Konfederasi Serikat Pekerja Indonesia (KSPI, Indonesian Trade Union Confederation). In the last few years, the KSPI has developed a reputation as an activist union. The strike was originally planned for August but was postponed to October as it became clear more time was needed to transform the growing support for the call into an effective, united strike. Many workers feel they have exhausted all possible ways of negotiation and dialogue with the bosses and the strike was felt as the best way to win new gains. A patient process of dialogues and meetings built unity among different trade unions. Finally, a joint meeting decided to hold a strike on 31 October and 1 November. Representatives of trade unions and workers organizations from at least 50 different cities took part in the 500 person strong meeting. Rather spontaneously, the meeting gave birth to a new coalition: Konferensi Nasional Gerakan Buruh (KNGB, National Conference of the Workers Movement). Since then, the KNGB already set up its own news portal: http://kngb-portal.blogspot.com. The atmosphere at the meeting was filled with hope and enthusiasm. Participants hope the unity will not only inspire the fragmented workers’ movements in other regions but that it will also make it possible to mobilize a growing number of workers. Such unity is needed because, since the last national strike, the ruling classes have launched a media campaign to denounce the workers’ demands as “unreasonable”. This idea has a lot of influence within the petty bourgeoisie and the somewhat better paid white-collar workers who often feel they have little in common with industrial workers. This division between industrial workers and white-collar workers is one often the lasting results of Soeharto’s New Order regime’s attempts to dissolve class consciousness. Since the national strike of 2012, Indonesia has seen vicious counter-attacks by the bosses and the state apparatus who use violence and legal threats against the workers movement. Indonesian president Susilo Bambang Yudhoyono (popularly known as SBY) also issued a decree to halt previously won wage increases, declaring that the minimum wage should not rise more than 5 to 10 per cent above the inflation rate. But too many people have been working for poverty wages too long for the confrontation to be avoided. To give just one of countless possible examples: Lufti is one of many previously unorganized workers who joined the strike. For years, he has been working for around 2 dollars per day. His wife works as a garbage collector and his underage children work as well. Workers like Lufti have put their hope in the union and the strike. The issue of wage increases is emerging as a point of polarization in Indonesian society. The workers movement is not only fighting the individual bosses but also to win support in the public opinion. The decision of KNGB left less than a month to organize the strike and mobilize workers across Indonesia. From 28 to 31 October, activists mobilized for the strike. From early in the morning of 28 October on, activists were busy leafleting and visiting factories to convince workers to go on strike and support the call for a 50 per cent wage increase. In different locations, students mobilized to show their support for the workers and were sometimes attacked by police. On 29 October, a march in the Pulogadung industrial zone of Jakarta, where industrial workers are concentrated, went from factory to factory and grew from 150 to 6000. Another industrial zone, Berikat Nusantara Bonded Zone (home to mostly garment and textile industries), also saw a large gathering. Police and company thugs unsuccessfully sought to prevent workers, almost all women, from joining the rally. Other industrial zones also saw protests. Not only throughout Java, but also in other regions workers mobilized, such as in Kalimantan and Sulawesi. In Jakarta, female garment workers in left their factories large numbers to join the strike. The Berikat Nusantara Bonded Zone was paralyzed on 31 October as at least 50.000 women workers went on strike. In the industrial port 5000 transportation and dockworkers joined the strike that day and closed one entry gate. Several industrial areas were reported to have been “paralysed” during the strike itself, such as Cimahi in eastern Java and the Ngoro industrial zone in Mojokerto, Central Java. The attacks have not broken the workers will to fight: despite earlier repression, seven industrial complexes in Bekasi were paralysed and workers from all over Bekasi took part in the protests. After the attack, on the second day of the strike, angry workers armed themselves with bamboo sticks to defend themselves. This time, the thugs did not show up. The police and army, who were earlier seen fraternizing with the thugs, now found the opportunity to search workers for weapons. As during earlier campaigns, social media and mobile telephones played an important role in the diffusion of the call to go on strike and in exchanging information and news between workers and activists. Of around 247 million Indonesians, 64 million use Facebook . As the strike and protests took place, activists spread news through social media. Facebook and even Twitter (usually considered to be the domain of the “middle classes”) were used as agitation tools. This way, news about for example the attack in Bekasi was spread. This helped to counter the portrayal of the movement in the regular media and to motivate workers to continue. According to police-figures, throughout Jakarta and its neighbors 60.000 workers went on strike. This claims lacks all credibility. Considering how many factories were affected, the participation must have been in the high hundreds of thousands. On 1 November, the movement in culminated with a protest at the office of Jakarta governor Joko “Jokowi” Widodo. Jokowi has won a lot of sympathy with some populist policies and his “man of the people” image. But now he showed his real face as he rejected the demands of the workers. In Jakarta, the minimum wage will be increased by only 11 per cent, one of the lowest increases won in this strike. When after the strike in 2012, Jokowi significantly increased wages, he was attacked by employers and in liberal media. Instead of confronting them, this time he chose to be on the bosses’ side. In Bekasi, workers won raises of between 40 and 50 per cent. After the historic strike of 2012, this movement was again a sign the Indonesian working class is gaining strength and confidence. True, only a minority of all workers joined the strike but in the important manufacture for export sector, participation was almost total. Workers feel the difference unity can make. In only one month, KNGB succeeded in bringing together movements in 20 provinces, 150 regencies and 40 industrial zones. To appreciate this accomplishment, one must keep in mind that Indonesia’s near 247 million people are spread over the largest island country of the world. Demands like a 50 per cent wage increase, social security and banning of outsourcing proved effective in winning the support of an increasing number of workers. The most urgent task for the Indonesian workers movement now will be to beat back the inevitable counter-attacks. Already, right-wing media outlets are spreading stories about spoiled workers who rather block the streets than “work to succeed in life”, and intimidate their colleagues if they do not go on strike. Media pundits claim wage increases are not necessary as long as workers can afford motorcycles (an absolute necessity for many of them) and that further wage increases will lead to economic collapse. But right now, the workers have the wind behind them. Even if the victories remain limited, the real gains they have won in the recent strikes have built their confidence and trust that more is possible. Indonesian leftists and labor activists are learning to counter the propaganda of the ruling class. The demand of a 50 per cent wage increase has not been dropped and will be one of the central issues in Indonesian politics in the coming period. On 3 November, the KNGB decided it will start planning another strike. We have seen only the beginning, the struggle continues. 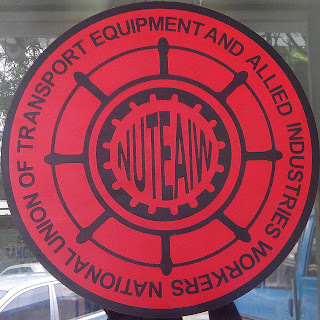 Group – Termination action against workers exercising their political rights is abhorred.